Gardening is all about planning ahead. When plants are tiny, sometimes it’s hard to imagine if things will really work out like you hope. I feared that drought would defeat one of my visions: ‘Country Girl’ mums with native asters. Guess they had a talk and agreed not to let me down. Patience is essential, too. I tend to buy small plants to extend my budget, so it can be a few years before my vision hits reality. I moved some of my young native Plumbago scandens late last spring. With the onset of heat and no rain, they were slow to rally. But they did! The nip last week turned some leaves to delicious purple, all the better to show off their sweet flowers. By this time next year, they’ll knock my socks off! Right now is an excellent time to plan ahead with planting. Last weekend, I got in some wildflower seeds (more to do this weekend), along with more lettuce, arugula, and radishes to join the parsley transplants already in. The bunnies anxiously await the parsley along with homegrown cilantro. But since I seed cilantro, they’ve got to wrangle their little imaginations for a few more weeks. The cooler weather has them growing like gangbusters! Patience is a useful quality to have in store when awaiting the return of Heartleaf skullcap (Scutellaria ovata). Mine haven’t yet returned, but while digging in that area, I unearthed their rhizomes. I took this opportunity to spread out their bounty to a few other areas. One reason I was digging was to add a new Hardy white gloxinia (Sinningia longituba). I tried one in the crape bed a few years ago and like the results! This one has a tuber that looks like a potato! It runs around like Heartleaf, but goes dormant in winter. My vision is Heartleaf from late fall to June, and Hardy white gloxinia until freeze. Here’s another vision I have in mind: Daphne’s pick of the week, native Texas poinsettia (Euphorbia cyathophora). I saw it in a garden a few years ago, but figured this gardener had a magic touch that I surely don’t have. By golly, Daphne reports that this one, also known as “fire on the mountain”, did great in the Extension Office demonstration garden all summer with just one irrigation a week. It’s an annual, but re-seeds with abandon. I’m getting this one! It really takes some vision when selecting and planting trees. Since our state tree, the pecan, is a gracious shade tree that rewards us with yummy food, this week Tom and Lisa Berdoll from Berdoll Pecan Farm go nuts about pecan trees! Lisa’s got tips for the best varieties, how to plant, and how to care for them in extreme drought. She ought to know how to do this right, since she and her husband Hal have been cultivating hundreds of acres of pecan trees in Cedar Creek since 1980. How many times have you been on the way to Bastrop and wanted to stop in and see Ms. Pearl the Squirrel? Not only can you buy a tried-and-true pecan tree of your own, you can pick up some of the Berdoll’s own delicious pecans and treats in the retail store, now owned by daughter Jennifer Berdoll Wammack and her husband Jared, with sister-in-law Brandi Berdoll as manager. What great holiday presents, huh? I just ordered some and they arrived in two days, so I didn’t have to be too patient about that! Trees are very patient with us, but our mistakes can push their patience to the limits. Just about the time they capture our vision, they can die, thanks to us. This week, Trisha continues “How Not To Kill a Tree” with a focus on maintenance mistakes. One is a common disease called “weedeateritis”. Wanna kill a tree? Whack the sensitive bark with a string trimmer or a lawn mower. Instead, mulch far around your trees and mulch. For one thing, that holds in soil moisture. For another, the barrier protects the bark from zealous edgers. But, don’t volcano mulch! Some landscapers like to do this, and Trisha nabbed a perfect example. It kills us (and your trees) that gardeners see this in public areas and decide it’s the right thing to do. Really, whatever started this? NEVER EVER pile mulch against a tree’s trunk. Leave it open to air and light. Don’t let English ivy or Asian jasmine climb up your trees, either. Not a good thing to do at all. Clip it and let it die before you pull it off so you don’t further harm the bark. For sure, don’t use herbicides around your trees! Patience is not a good quality when it comes to weeds. Pluck ‘em now, or scream later. There are some that are downright parasitic, like dodder, that’s latched onto Diane Hanna’s potted firecracker fern. I’ve never seen this before! This dodder probably came along with Diane’s plant. Since it’s on a mission to reseed all over the place, it’s important to remove it immediately. Diane will also need to cut off any parts of the plant that it’s invaded. Get Daphne’s complete answer, and thanks, Diane! On tour, feast your eyes on this edible garden! A once forbidding slope, now a garden gracefully directs water to terraces of fruits, vegetables, herbs and ornamentals. 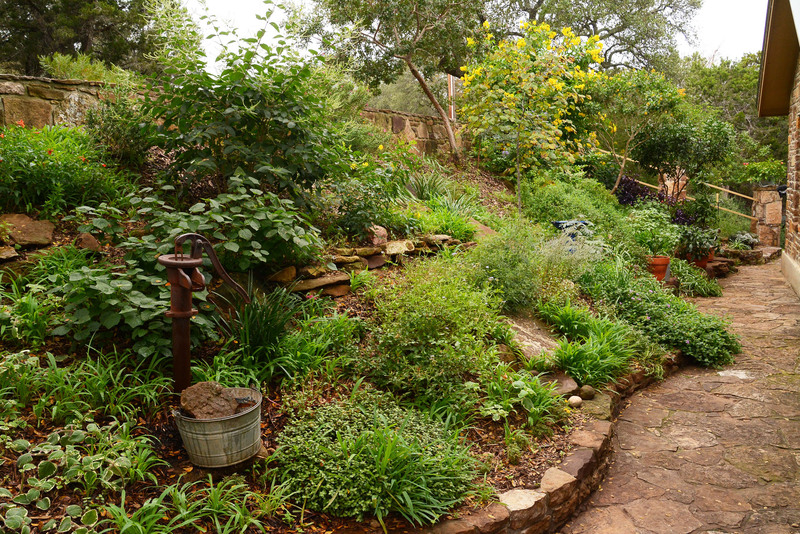 To create an edible garden that also attracts wildlife, Suzanne and John Shore worked with Rosemary Vincent and Kellan Vincent of Vincent Landscapes, Inc.